It is impossible to chronicle the last four decades of British pop music without constant reference to Elton John and his huge influence. 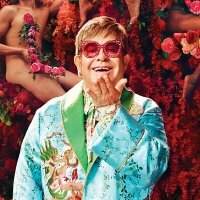 From boggle-eyed pianist drunk on the dressing-up box to Knight of the Realm, Elton John has transitioned from pub singer Reggie Dwight to Academy Awards and Las Vegas residencies, with popularity and success beyond imagination. The accolades alone are far too numerous to list here. Just the stats are frightening. With lyricist collaborator Bernie Taupin, Elton John has released 30 or so albums, contributing to global sales in excess of 260 million. In the US, he delivered seven consecutive No 1 albums and, in the list of all-time Top 40 hits there, he scores 56 - second only to Elvis and five ahead of the Beatles. Nine of those 56 Top 40 singles reached No 1 in America, including Candle in the Wind 1997. His rewritten ode to Diana, Princess of Wales, was No 1 everywhere (even on the moon), selling a record 33 million copies alone, and contributing to total single sales of more than 130 million. He has won six Grammy Awards, an Oscar, a Golden Globe and a Tony Award. And more than this, although it might not always be fashionable to admit it, everyone knows the words to at least one Elton John song. Drunken teenage New Year's Eve parties singing along to 'Crocodile Rock', humming along to the Sky Sports trailer that used 'Are You Ready For Love', serenading the cat with 'Rocket Man'. It is an accolade afforded to so few artists. There will be singing along aplenty when Elton's summer dates begin in Taunton on 3rd June, followed by shows in Harrogate, Chesterfield, Falkirk and Newcastle, before the final date announced so far at the LG Arena in Birmingham on 15th June 2012. We have tickets for the Chesterfield date available now, priced £40. We will have tickets available for the remaining gigs when they go on sale on Friday 2nd December at 9AM for Falkirk and Newcastle, and 10AM for Taunton, Harrogate and Birmingham. All are priced from £40 except for Taunton (£50) and Harrogate (£55).